Well known Saskatchewan artist and educator Wynona Mulcaster died on August 25th, at her ranch in San Miguel de Allende, Mexico, at the age of 101. Wynona Mulcaster was born in 1915 in Prince Albert, Saskatchewan, and started devoting herself to artmaking when she was just 17 years old. She studied art with Ernest Lindner from 1935 to 1945, earning her Bachelor of Arts from the University of Saskatchewan in Saskatoon in 1943. Mulcaster then went on to study at the Banff School of Fine Arts (1946), and at the School of Art and Design in Montreal under Arthur Lismer (1947). 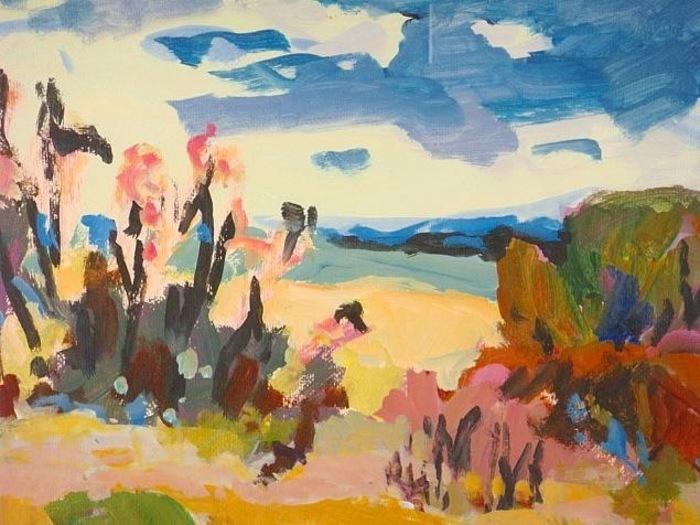 Mulcaster also attended many workshops at Emma Lake between 1937 and 1993, studying with Joseph Plaskett, Will Barnett, and Kenneth Noland, among many others. Mulcaster spent several years as an art teacher to school children in Prince Albert and rural Saskatchewan (1937-1943), then taught art at the Saskatchewan Teachers' College in Saskatoon, where she served as Director of Art Education (1945-1948), and at the University of Saskatchewan (1964-1977). Her students included Robert Murray, Otto Rogers, and Allen Sapp. Mulcaster's art led her to travel to Europe to visit major galleries in 1958 and 1959, after receiving a Canada Council grant. In 1976, she received a second Canada Council grant that allowed her to study at the Instituto Allende in San Miguel de Allende, Mexico, receiving an MFA from this world-class art school in 1976. Mulcaster lived much of the next 40 years in this Mexican city with its thriving art community, including many Canadians. Mulcaster had an interest in horses, and they were a recurring subject matter throughout her career. In 1945 she founded the Saskatoon Pony Club, where she taught riding most days, with no salary, right up to 1973. Mulcaster was inducted into the Saskatoon Sports Hall of Fame for this work in 1994. In 1993, Wynona Mulcaster was awarded the Saskatchewan Arts Board Lifetime Achievement Award for Excellence in the Arts.